This Q5 is really in a class of its own it you take into consideration the Carfax, the color combination, and most importantly the rare option combinations this particular Q5 comes with. The two options that make this Q5 different from all the rest is the "Sport seat package" and the Bang & Olufson sound system. To have these two options in the same car is extremely hard to find and make for a totally different experience while inside driving the car. After all, the interior is where you reside while you drive the car. The seats have much more bolstering which hug you in your seat much better while driving a little more aggressively. Plus they look soooo much better than the base Audi seats. The Bang & Olufson sound is second to none when it comes to sound systems and is like a live symphony is playing in your car. It is crisp and clear and if you like music which most people do, you will be blown away with the quality of the Bang & Olufson sound system. The 19 inch wheels are upgraded on the premium plus model and have 4 BRAND NEW tires all the way around. 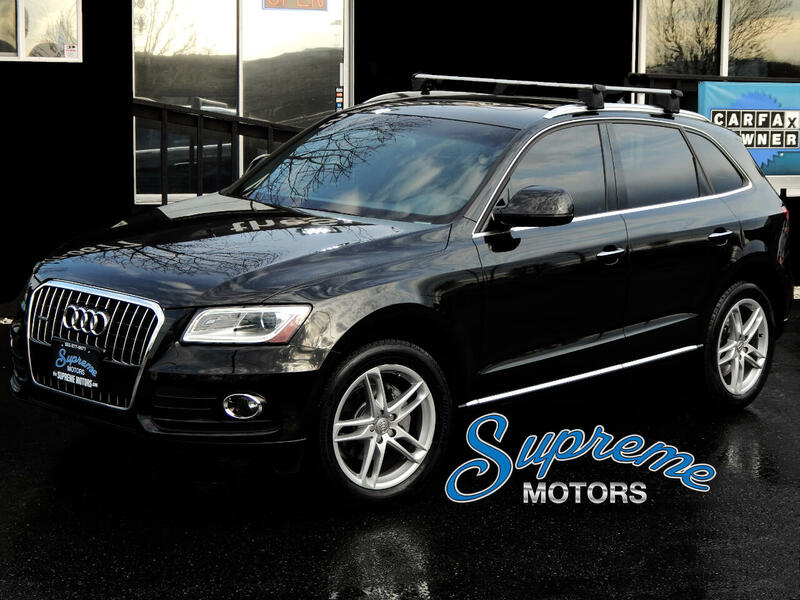 The roof rack is a piece and really completes the look of this Q5 on the exterior. There is also a little bit of factory warranty left and it is much cheaper to extend the warranty while it is still under factory warranty. With the combination of the one owner, clean Carfax, black on black, the seats, the bang, the wheels, and the roof rack, these options and history make it a one of a kind car in the market so dont wait or dont settle for one without all these attributes. It might be "cheaper" but that never means it is a "better deal." Call or email with any questions or stop by anytime to check it out.